Hey ladies, are you looking for some fabulous designs? I bet you do, so here I’m again with another stunning collection. This time, I’m bringing to you the Balmain’s 2017 Resort Womenswear Collection. 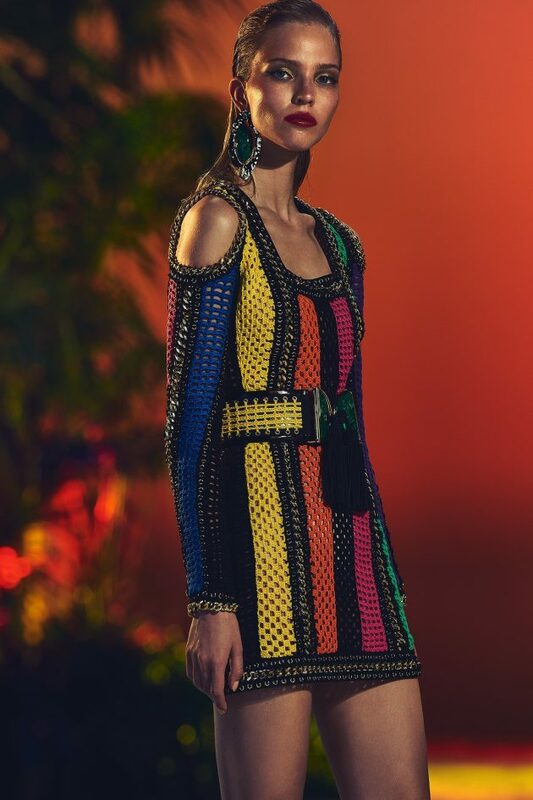 Trapped between luxurious Seventies and haute couture-esque Nineties vibes inspired by Guy Bourdin’s bold fashion photography, Balmain’s 2017 Resort Womenswear Collection relies on a strong injection of color, reflecting the intense shades of the sea, sky and sand. Color-wise, we could divide the line-up into three main themes: on the one hand it showcases rich and dark-toned solid colors, often combined to create elegant yet less bright color-blocking motifs than usual, while on the other hand multi-colored stripes come arranged either geometrically or abstractly. The third group merges the characteristics of the first two color palettes. 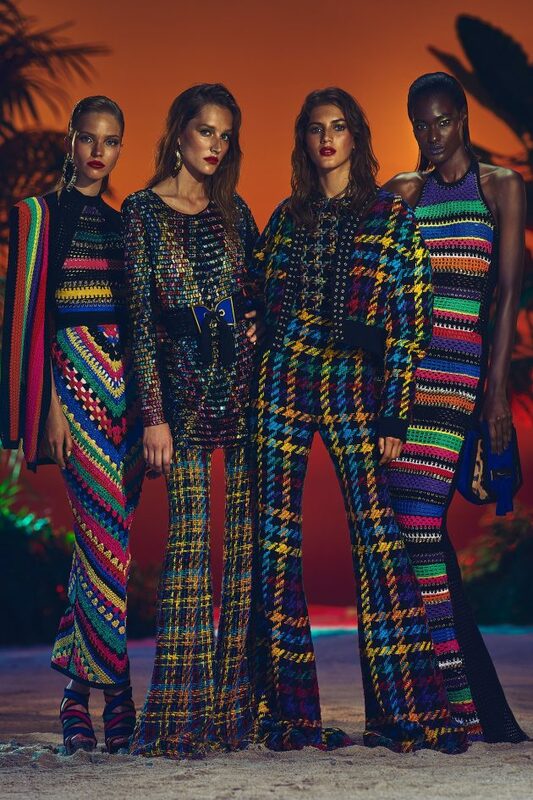 In this range, all of the ensembles got dipped into vivid pinks, yellows, super shimmery light blues and oranges, accentuating the figures and harmonizing the overall resort 2017 line-up with a more balanced array of shades. As for the main staples, lines and cuts, Olivier Rousteing revamped classic Balmain looks with fresher, more modern pieces, such as skimpy crop-tops, asymmetrical skirts and edgy cut-outs on the shoulders. As a result, the collection is perfectly balanced in the artisanal sense as well. The maxi cardigans skillfully balance the short tops, while the sinuous floor-length dresses get interrupted with billowy wrapped skirts and blouses. When it comes to the ‘freshest ensembles of all’, Rousteing revisited a timeless version of the safari trench coat, this time created under the influence of the varsity jacket, as well as designed denim overalls, and frilled crops with off-shoulder necklines, which are very likely to follow us all the year round, every day, starting off from this summer. 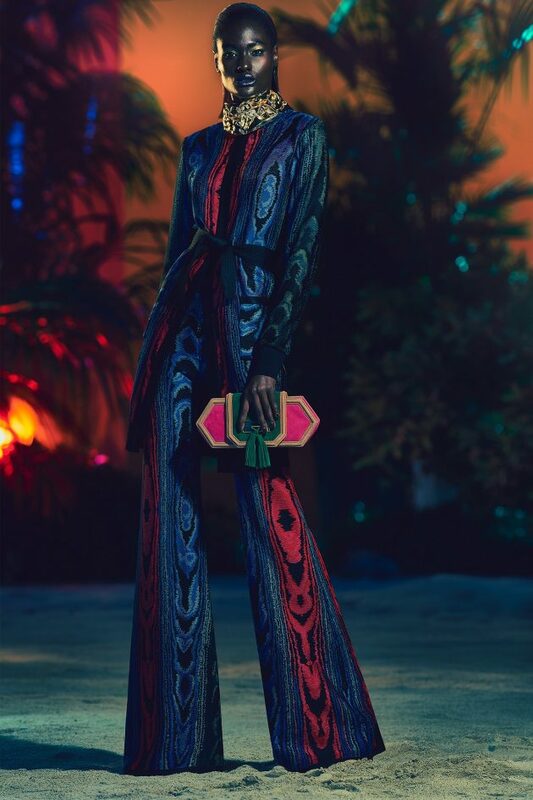 And, of course, Rousteing went strong on the accessory line too, utilizing the same patterns on geometric clutches, handbags and totes as well. I’m sure that Balmain’s newest handbag collection will be in the arms of a Kardashian or Jenner quite soon. Your thoughts on the latest from Balmain?